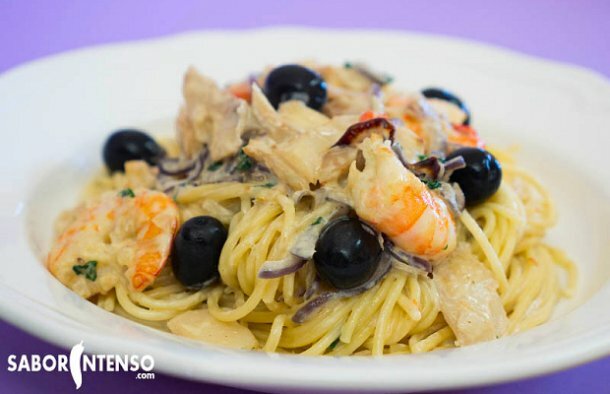 This Portuguese style spaghetti with cod and cream ( esparguete com bacalhau e natas) recipe is easy to make and it's a great meal for a weeknight. In a pan with boiling water, place the cod loin to cook for about 10 minutes. After that time, remove it with a slotted spoon to a dish and let it cool. Using the water you cooked the cod in, add a tablespoon of olive oil and a little salt. Add the spaghetti, stir with a fork and cook the time indicated on the package. After the spaghetti is cooked, drain it and place it under cold water to prevent it from cooking more. Peel the shrimp and remove the gut. Remove the skin and bone from the cod and shred it using your hands. In a frying pan, heat the remaining olive oil, onion, garlic and bay leaves. Stir and cook until the onion softens. When sautéed, add the shrimp, cod and parsley. Saute well until the shrimp is cooked and changes color. Finally, add the spaghetti and mix everything very well. 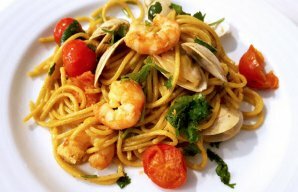 This Portuguese spaghetti with shrimp, clams and cherry tomatoes (esparguete com camarão, ameijoas e tomate cereja) is very flavorful. How to make Portuguese style Sausage (Chouriço) Pizza. This Portuguese style pasta sauce recipe is very creamy, rich and delicious and goes with almost any pasta.